Visit eHow for Management Success! Found this on CNN this morning. 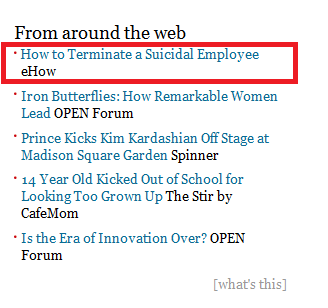 Strangely, the article that it linked to had no information about actually going about terminating a suicidal employee. I guess you’re just supposed to be patient and hope they eventually terminate themselves? They did, however, have instructions on how to fire employees. So don’t bother consulting your HR department on this matter, just go through these eight simple steps. And be prepared to lie, as it says in Step 5. Thanks, eHow! Now I know where most managers get their training.